We're pleased to announce v0.8.2.0 of Test Recorder, now available in the weekly channel. We've added some additional features and configuration options for power users, as well as fixed a number of minor bugs and issues. Account Information: Update your API Key and account information. This information is used to verify your Xamarin Test Cloud access, and to help us with debugging any issues reported via our Bug Report tool. Android Keystore : Test Recorder will by default use Calabash's debug Android keystore for resigning Android apps, which can cause issues for some apps. This option allows testers to provide their own keystore to use in resigning. Provisioning Profile: Test Recorder will by default automatically search for an installed provisioning profile that matches the selected app. 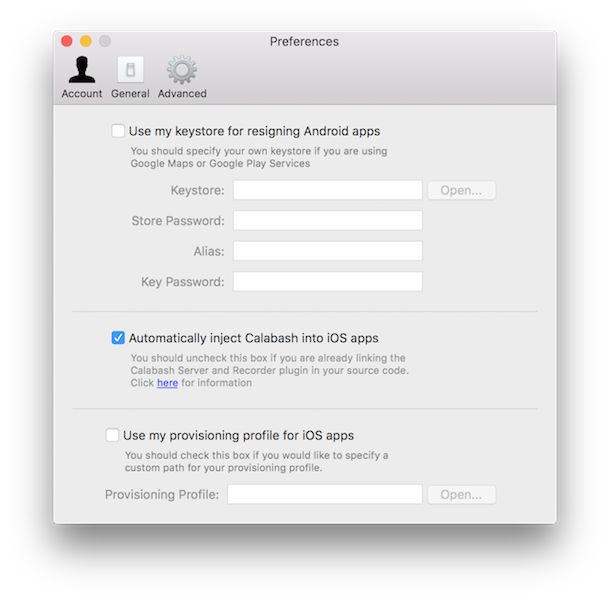 Users can now choose which provisioning profile they wish Test Recorder to use. Current users of Test Recorder should be prompted to update the next time they launch their app. You can also download the latest version of Test Recorder at https://xamarin.com/test-cloud/recorder. As always, we're here to answer any questions you may have. Inspector and Test Recorder should be combined into 1 tool. When developing a test, I would like to inspect the UI hierarchy and look at properties and such and click on widgets in the hierarchy to get information about them. Having a REPL helps a little, but it is command line while Inspector is graphical. The Test Recorder UI that display the steps should be fully editable so that I can create steps, edit steps, reorder steps, etc. And it would be really nice if while editing a step, a dropdown allows me to select a UI control from the current hierarchy tree or bring up the Inspector window. Most important, I want the ability to attach the Test Recorder to an already running app WITHOUT resetting that app back to an initial state. Sometimes I want to use the Test Recorder just to generate the C# code for me for just a few steps that I am having trouble writing by hand. I may have my app on a certain screen in a certain state and now I want to start recording. As soon as I setup Test Recorder, my app resets and restarts back to scratch and I have lost my app state. Test Recorder is failing to run (with every launch) with the details attached.